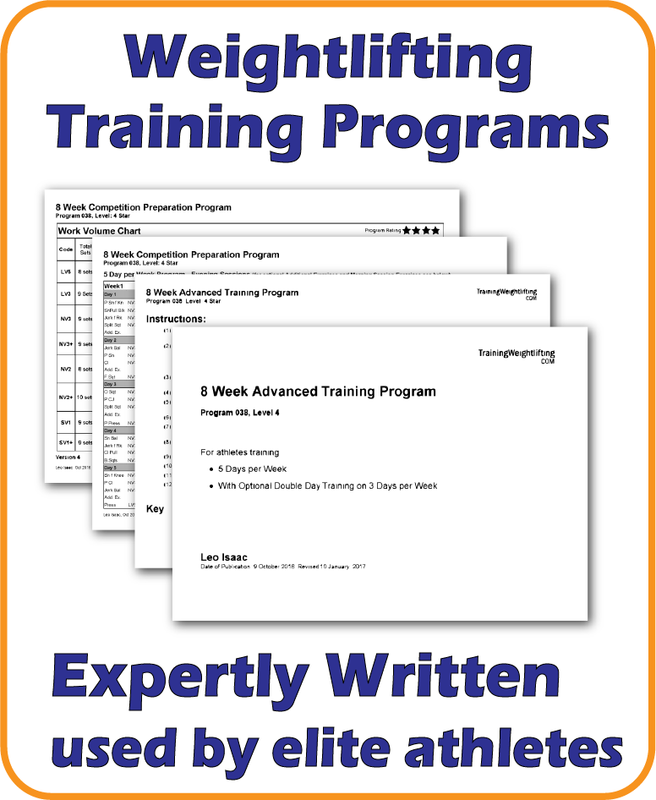 If you are looking for Advanced Weightlifting Programs that are professionally written and immediately downloadable, you have come to the right p lace. There are currently 12 Advanced Weightlifting Programs immediately available and more are in the development pipeline. Programs range from 4 weeks to 15 weeks in duration and include detailed instructions and suggestions for program changes according to individual weaknesses. The Advanced Athlete is one who has reached a high level of commitment and engages in regular consistent training 5 – 8 workouts per week. This level of training requires considerable time and effort spent on recovery and wellness by maintaining good sleep patterns, exemplary standards of nutrition and consistent work on flexibility and injury management/ prevention. An advanced weightlifting program is one that prescribes the level of work required for athletes aspiring to be highly competitive at the national championships level. The frequency and volume of work prescribed is physiologically and psychologically demanding and should not be undertaken by athletes without guidance and due consideration for health and well-being. Advanced weightlifting programs assume that the athlete has developed a reasonable level of competency in Weightlifting technique but may require a degree of “fine tuning” in order to be ready for major competition. In general, the exercise schedule in an Advanced Weightlifting program contains fewer assistance exercises that focus on body position correctness but more time is spent pursuing power and strength development . In particular, there is a significant level of work on pulls and squats of various types. A recommended intensity (heaviness) for each exercise of each session. Workouts follow a cyclical pattern of intensity allowing the athlete to recover between the highest intensity workouts. A guide to the volume of work to be performed on each exercise. The guide prescribes 8 levels of volume. There are 3 volume levels that allow the athlete to go beyond the stated workout parameters if the athlete is feeling good, and 5 volume levels which restrict the athlete only to the stated intensity and number of sets. Instructions on how to interpret the program, in particular how to work out percentages. Recommendations on how to incorporate additional exercises based on individual weaknesses. Suggestions on how to incorporate extra training sessions (e.g. 3 mornings per week) into the training program. You can purchase the Advanced Training Program Bundle by clicking the blue link below. After purchase, you will see a link titled “Advanced Program Bundle” in the Members Area on the right side of the screen.